The Grover Pro Percussion T2/PHBR 10" Double Row Tambourine features Phosphor Bronze tambourine jingles, double mounted premium white skin head, captive pin system, staggered jingle slot configuration, solid hardwood shell, and reduced width grip. A free tambourine bag is also included. Phosphor Bronze is preferred by percussionists who seek darker sound colors. Phosphor Bronze compliments the deep character of romantic European orchestral repertoire. Equally suited for concert band or small ensemble, this special alloy is for those who gravitate towards mid-range and darker overtones. 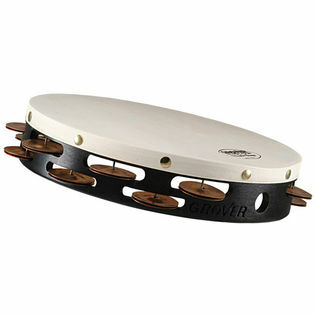 Grover tambourines have always used hand-select, premium white skin heads. While the costs of top grade white heads have risen dramatically over the years, Grover remains committed to producing the world's finest tambourine. It would be easier (and less costly) to use translucent, imported heads, but Grover refuses to compromise any component of their product. The Grover tambourine head will provide many years of trouble-free service. Before Grover Pro, percussionists often complained that their jingle pins would come loose or even fall out completely. Grover developed a system where the hardened steel pins that hold the jingles in place are inserted from the top edge, prior to head mounting. The pins are countersunk, back filled, and permanently housed within the solid shell. Using renewable hardwoods, Grover painstakingly steam bend every tambourine shell. The raw shells are allowed to dry naturally in a forming mold and are then precision lathe turned. 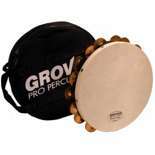 This ensures that every Grover tambourine shell will remain perfectly round throughout a lifetime of use. Top Orchestral percussionists the world over consider Grover tambourines to be the "Stradivarius" of concert tambourines. Found in the world's finest concert halls, Grover tambourines have been resounding with crystal-clear clarity and full, rich timbres for over 29 years! Meticulous craftsmen painstakingly handcraft each tambourine one at a time. The new Roll Ring™ by Grover Pro Percussion is now included. It is designed to aid concert percussionists with the execution of thumb/finger tambourine rolls. This circular ring helps players easily create the friction needed to produce a smooth, even sounding roll. The 1? wide band is specially shaped to conform to the outer edge of a headed concert tambourine. It has a special non-permanent adhesive backing that makes it super easy to put on and take off in just seconds! The Roll Ring is reusable and can be applied and stored numerous times. The Grover Pro Tambourine cuts through and compliments each track with such precision, and bandmates, touring friends, and producers love the sound. I have found it to be very useful across the board, and would recommend any of the Grover Tambourines, especially the Double Row! When looking for something different from the GS, but not too "modern" this is a great choice. This tambourine produces an unmatched sound quality. The sound is very wet but can be dried up by slightly changing ones stroke. This tambourine sounds great and is well audible in any concert hall. My favorite metal for tambourines is the P. Bronze because of the dark sound it creates. Anything brighter to my ear tends to sound too tinny like a fisher price toy.